Have a Blush with your blush! Drink. Play. Learn. This is what we consider fun. A lovely night in a fabulous spot where you can bring friends or meet new ones all while you indulge yourself in the latest makeup trends. Learn tips and tricks on yourself while you sip and sizzle for an endless array of looks. 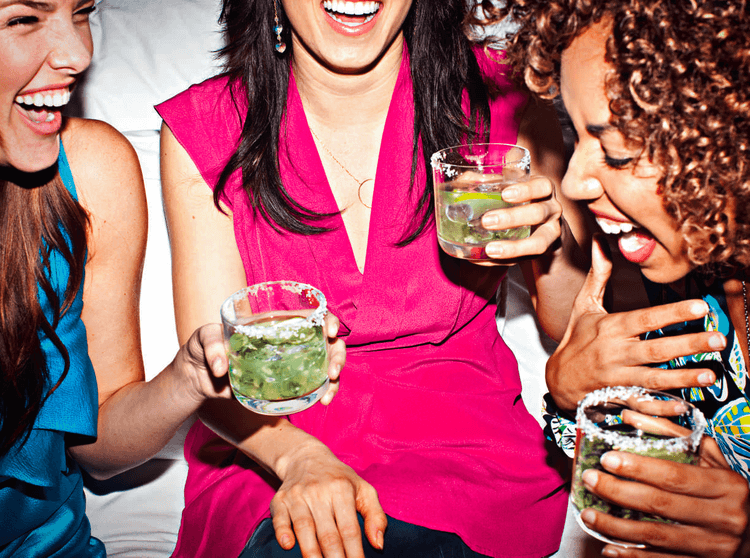 This is the ultimate in girl's night out fun! Let our Makeup Artists lead the way for an event quite unlike any other. A different theme each night - you can master looks you never dreamed possible. It's as simple as selecting the event, theme and location that best suits you. One part night out, one part tutorial, two parts cheeky fun with a dash of whimsy. Our artists are both masters of their craft and champions of teaching others to do it for themselves. Making it their business to not only stay on trend in the world of makeup - but versed in what's to come. Combining easy to learn applications to try on yourself with a flair for the subtle and dramatic. Consider them your own personal makeup gurus! Makeup Tonight events are held in casually chic locations that lend themselves to a fun, sophisticated night out. 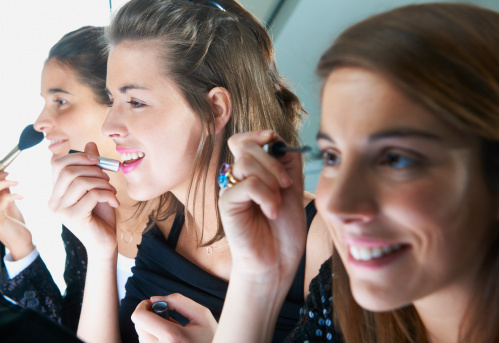 With friends or alone - our events are that perfect opportunity to unwind, have a drink and garner makeup know-how. Learn from professionals who like yourself never stopped loving to play with makeup. We are proud to offer an array of beauty themed Makeup Application events. Whether you stick to one set style or change your makeup look every other day - we have an event for you. From the "Natural Beauty" to "Ready for the Red Carpet", learn how to transform yourself from drab to fab in no time! Master your makeup skills and stay on top of the ever-evolving and exciting makeup trends. Welcome to Makeup Tonight. We offer an array of makeup themed events where you can learn different looks and styles on your own face, under the guidance of one our fabulous Makeup artists, in a fun, chic environment. Have a blush with your blush! Learn with friends or come alone and meet new ones while you sip, sway and sizzle your way to fabulous looks. Makeup today has changed quite a bit from years gone by. It can be overwhelming to keep up with the ever changing trends and the enormous selection of cosmetics available to us. Gone are the days of a basic mascara and lip gloss. Today there are literally thousands of every type of cosmetic available. How do we know which one is right for us? Trial and error can be costly and trying to learn all of the new trends can be frustrating. We are here to take the frustration out of it and teach ladies how to create amazing and gorgeous new styles for themselves, on themselves. As you can see there is quite an array of different makeup themes to choose from. Please select an event that reflects your style or one which reflects an area in which you desire to learn about. Simply click on your city to view the list of upcoming events in your area. Once you have selected the event that appeals to you, go ahead and register through the website. You will receive an email confirmation with details of your event and check in time. Our events are Hosted by one of our own popular and ultra glamorous makeup artists. What they don’t know about makeup isn’t worth knowing! When you arrive at the venue you will be greeted by your Makeup Instructor for the evening. Upon check-in, your Instructor will give you the makeup tools you need for the evening, to partner with the items we have suggested you bring with you. The items we provide for you are essential to the theme of the evening and yours to take home at the end of the night. Each table setting will have your very own lit mirror to use throughout the evening. Please be sure to bring with you the items suggested on your chosen event - your favorite everyday items and of course, anything else you wish to bring. Your Instructor will also have her professional kit with her to fill in for any items you may not have. You will not be asked to purchase anything at the event - if you need any different items or colors, your Instructor will assist with this from her makeup collection. Along with your provided items, you will also be handed an instruction card. This card will highlight the points of the evening and will serve as an informal instruction card on how to achieve your desired results for the night. It’s best to arrive with minimal makeup on so that you can maximize the style you are aiming to achieve. If you feel more comfortable arriving with some makeup on, there will be complimentary makeup remover and cotton swabs available for your use at each table. Your Instructor can assist you with removal or you are welcome to take care of this yourself. You will also receive a note card with a short bio about your Instructor. This allows you to get to know a bit about your Instructor before the night begins. Don’t worry if you make any mistakes or want to start over. Our Instructor is there to guide you through the evening and to help you learn quick and easy techniques that you can use again and again! When the event is over, you are welcome to stay and mingle with the other ladies in attendance or chat with your Instructor about any questions you may have or additional tips for re-creating your new style at home. As you will be looking like a Goddess at the end of the night - maybe your night has only just begun! How much makeup should I be wearing when I arrive? It’s really up to you how much makeup you want to have on when you arrive. You are welcome to dare to go bare or arrive with your basic foundation in place, or even more if you prefer. Each event is labeled with our suggestion of how much makeup to wear upon arrival. How will I know which event is right for me? We offer quite an array of different makeup themes. Some ladies are looking to learn specific techniques such as contouring or that elusive smoky eye. Others want to know how to transform from day to night with ease - and others are simply looking for different looks to add to the repertoire. Do I bring my own makeup? Yes. Please do bring your basics - items that you use everyday and carry in your makeup bag. The best part of our events is that you get to learn how to use your own makeup and not just experience makeup that you may never use again or be able to find on your own. Your instructor will also have her full professional kit of makeup for any tips and touch-ups that she can add onto your look. Do I bring my own Brushes and Applicators? Each event has a description of the items we suggest you bring with you and the essentials we provide and gift to you. Not all events require brushes - if brushes are required for the particular event you have chosen we will provide brand new brushes for your use throughout the evening and are yours to keep. For the "Flawless Foundation" event we provide a brand new, full size BEAUTY BLENDER - the results are amazing and far superior to any brush. How will I see my face at the bar or restaurant? No need to worry. The table settings will have lit mirrors on them, provided by your Instructor - these mirrors are portable and adjustable. Can I drink during the event? Blush with your blush? Of course! Part of the fun of Makeup Tonight is the opportunity to mix and mingle with other great ladies and enjoy a drink in the process. Can I come with friends? Definitely! Makeup Tonight is a super fun experience whether you are alone or with friends. If you go alone we certainly encourage mingling with the other ladies in attendance and networking is fun in groups too - you never know who you might meet! What if I am running late or can’t make the event, how can I reschedule? If you are running late, simply call or email us and we will let your Instructor know. If you need to reschedule let us know, preferably within 24 hours of your scheduled event. Will I be asked to register for anything at the event or pressured into buying makeup? Absolutely not! There is nothing for sale at our events, no sales pressure, just learning and fun! What if I make a mistake with my makeup and need to correct it? No need to worry. Practice makes perfect! There will be plenty of cotton balls, makeup remover and tissues on hand. You can take care of removal yourself or ask your Instructor to help you with this. How long does each event last? Typically each event lasts about two hours from check in time to finish. Attendees check in at 7:30pm and we generally finish up by about 9:00pm. Will I be photographed or filmed for any print or promo editorials? Absolutely not. No one will be filmed or photographed at any time. You are welcome of course to take selfies of your fabulous new looks! How do I pay or register for my event and are there any membership fees? There are no membership fees. Simply select your city and scroll down for available events and themes. When you see an event you would like to attend - select 'Order Now'. Payment is not accepted at the venue - all registrations must be done online through our website. How many ladies typically attend? Each event is usually 20 ladies. Whilst we want you to meet lots of potential new friends, we still want everyone to be able to maximize time with their Instructor if need be, so we find that 20 ladies in attendance is most beneficial for everyone. What time should I arrive for the event? Published start times are on our website and will also be given to you in your email confirmation. We aim to wait for everyone to arrive, but we don’t want to keep the whole group waiting. If you are running late, that is fine - we will get you set up as soon as you arrive. How do I reserve my space/register for an event? Registering is quick and easy! Simply select your city and scroll down for the list of events. The website will guide you through registering for yourself. If you want to register to go with friends also, simply change the number in the “quantity” box to reflect how many seats you need. How can I bring a MakeUp Tonight event to me? This is perfect for bridal or bachelorette parties, sorority houses or any group of ladies looking to have a night of fun and learning - MakeUp Tonight ToGo style! We can discuss a package for you based on your location and number of ladies in your party. Please email info@makeuptonight.com for all MakeUp Tonight - ToGo inquiries.